By: Tim Callaghan, Office of U.S. Foreign Disaster Assistance (OFDA) Senior Regional Advisor for Latin America and the Caribbean, U.S. Agency for International Development (USAID). On the night of September 18, Hurricane Maria struck the eastern Caribbean island of Dominica as a Category 5 storm. Maria’s relentless rains and winds devastated the country, killing at least 27 people and affecting all 71,000 island residents. In the northern village of Calibishie, winds exceeding 160 miles per hour ripped the roof off the Edwards family home. While the hurricane raged, the Edwardses sought shelter at a neighbor’s house. 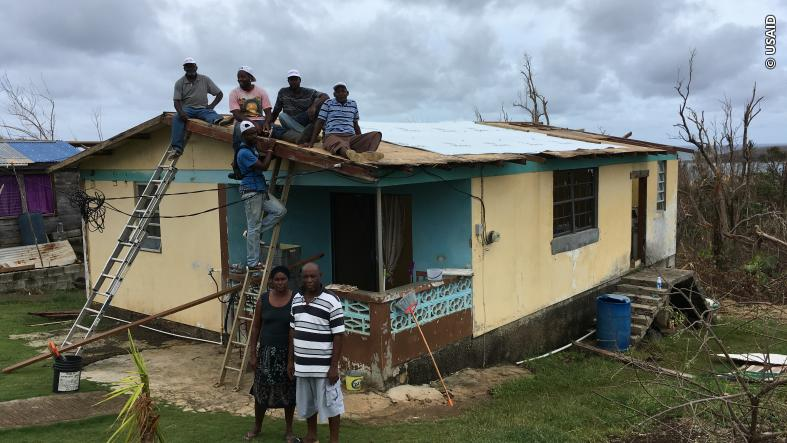 The next morning, the family returned home to find most of their belongings destroyed and much of their roof missing — a fate shared by the majority of Dominica’s residents. Within days of Maria’s passage, members of USAID’s Caribbean Hurricanes Disaster Assistance Response Team (DART) — originally activated for early September’s Hurricane Irma — arrived in Dominica to assess conditions. Noting the critical need for materials to repair roofs, the DART quickly mobilized an initial 400 rolls of heavy-duty plastic sheeting, sufficient to assist up to 20,000 people, from USAID stockpiles in Miami, Florida. Working with U.S. Department of Defense’s Southern Command, the DART rapidly delivered the plastic sheeting to thousands of families in need in Dominica, like the Edwardses. The DART also trained a team of local builders to accompany the distributions and demonstrate to community members how to affix the material to their damaged roofs properly, such as by bending protruding nail points under their wooden straps and using washers to avoid tearing the sheeting. Between September 29 and October 2, the DART distributed plastic sheeting to St. Andrew, St. David, St. John, and St. Joseph parishes in northern and eastern Dominica, meeting the urgent shelter needs of more than 2,500 hurricane-affected households. A small team of USAID disaster experts remains on the ground in Dominica to monitor ongoing response activities and support early recovery efforts. USAID also continues to work with the Government of Dominica and USAID partners to provide critical relief supplies, clear debris, and address water, sanitation, and shelter needs. Editor’s Note: This entry also appears on DipNote, the U.S. Department of State’s official blog.